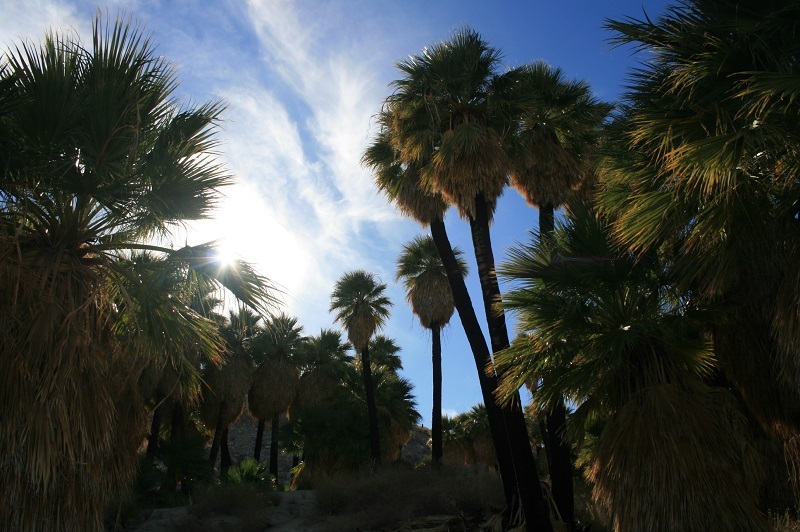 Location: Anza-Borrego Desert State Park on County Road S2. From Highway 78, head southeast on S2 for 30.2 miles. At mile marker 47.1, shortly past Indian Gorge, look for an unsigned dirt road on the right. 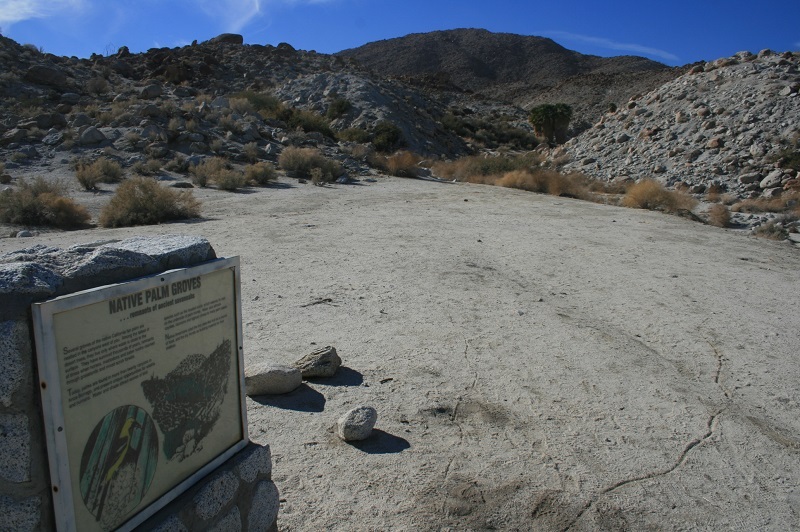 Follow it 0.7 miles to the Mountain Palm Springs Campground and park in the day use area at the western end of the campground. From I-8 in Ocotillo, take exit 89 for Imperial Highway (S2). 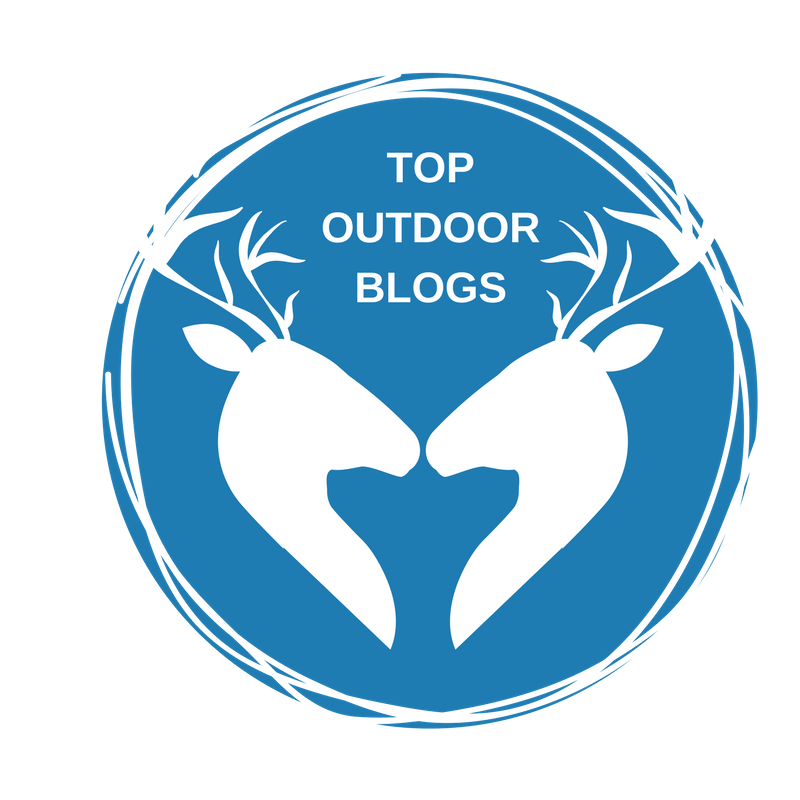 Head northwest on S2 for 17.2 miles. Turn left onto the unsigned dirt road (if you reach Indian Gorge you’ve come too far). Follow it to the day use area at the west end of the campground. 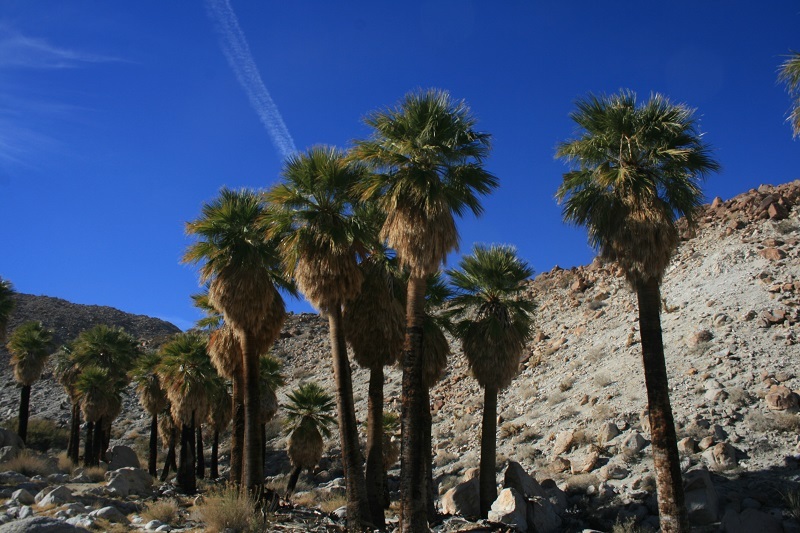 This loop tours the four major palm groves in the Mountain Palm Springs area of Anza-Borrego Desert State Park. In addition to the oases, highlights on this trip include expansive desert views and interesting geology, including a narrow cave. The route is largely unsigned and can be a little ambiguous, but it receives enough visitation that there will usually be footprints to follow. 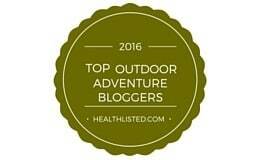 It’s also the type of place that can be fun to explore without having a specific agenda in mind. 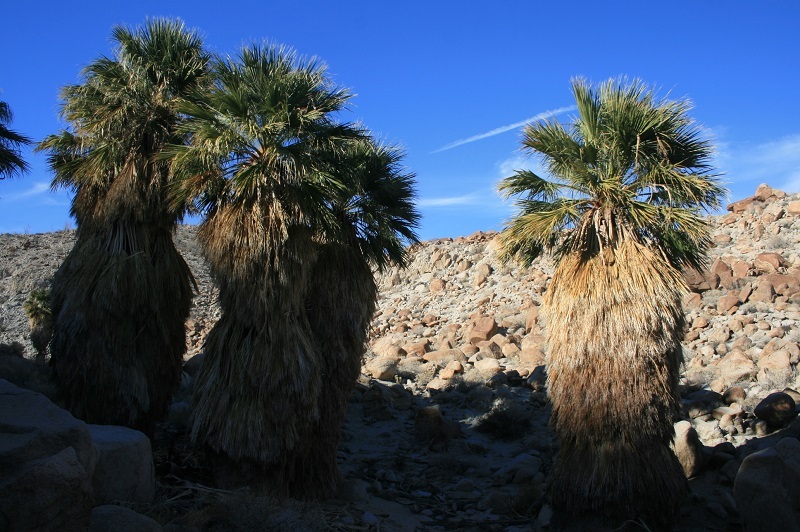 Begin by the trail marker, heading west into a wash toward three tall palms. Shortly beyond these three you come to the first group, the Pygmy Palms. 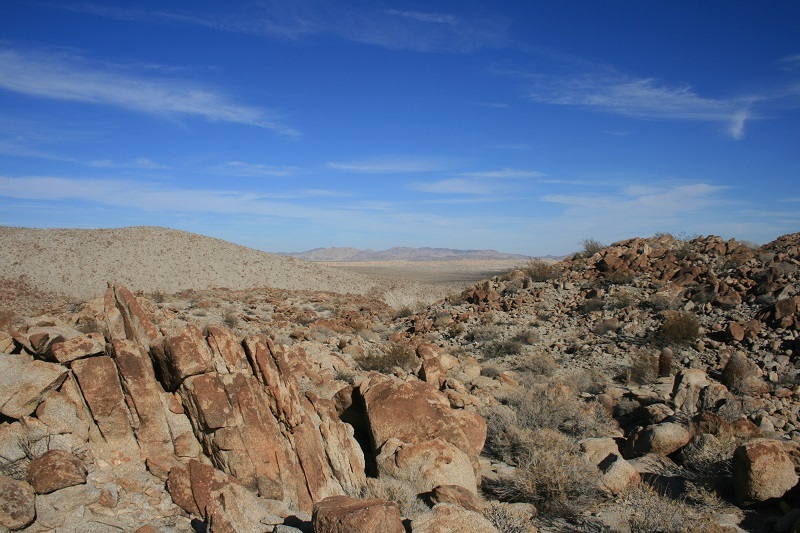 The trail then climbs out of the wash to an ocotillo-dotted ridge, bending southwest and meeting a junction (0.5 miles.) 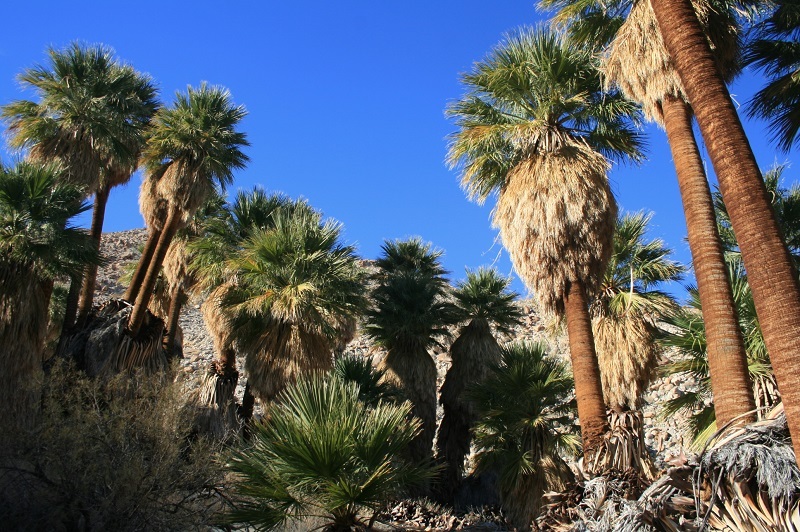 One trail continues south toward Bow Willow Campground, but your route will take you west (right) toward the Southwest Palms, visible in the distance. Follow a ridge 0.2 miles. 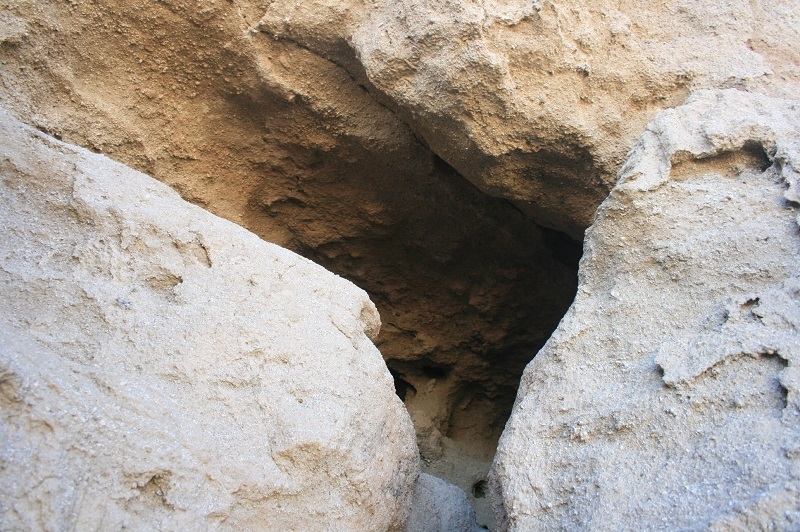 Here, you can take a side-trip to a cave a few dozen yards south of the palms. A vague trail climbs through the palm grove. Just as it enters a narrow canyon, look for another unsigned trail, making a hard right and beginning to climb up a ridge, passing an elephant tree. 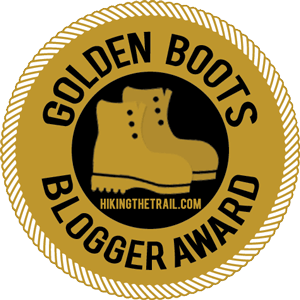 For the next half mile or so, you’ll enjoy panoramic views of the Carrizo Valley and the canyons in which you were just walking, including the Pygmy Grove. The trail is fairly easy to follow as it generally clings to the higher reaches of the ridge. 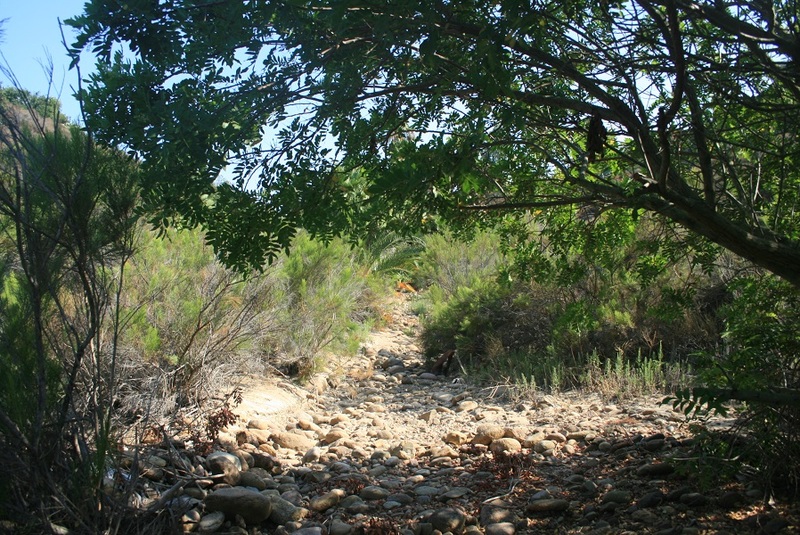 The trail then reaches Surprise Canyon – perhaps named because of its sudden appearance to hikers following the ridge. For a moment it looks as if there’s no sane way down into the canyon, but the trail bends to gently descend the ridge toward the Surprise Grove. 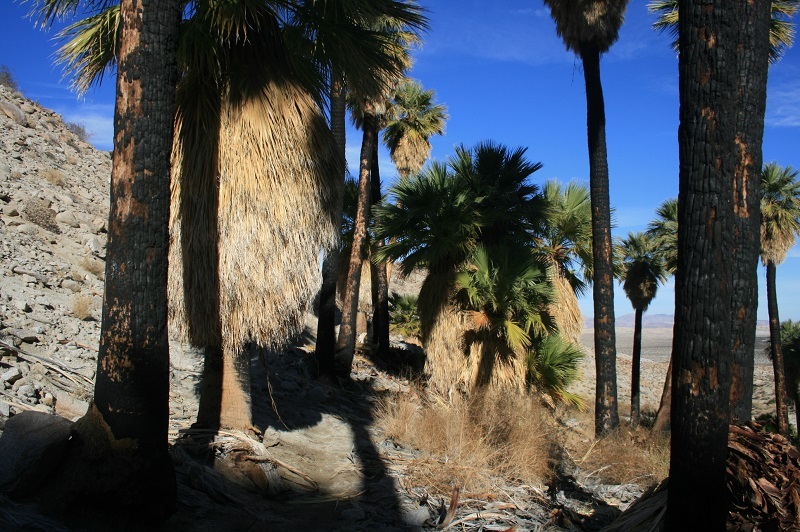 Turn left and follow the wash through tangles of mesquite and fallen palm fronds about half a mile to Palm Bowl Grove, the final and largest grove of the trip. Here you can relax for a few minutes, enjoying the solitude before retracing your steps. Continue past the Surprise Grove and follow the wash back toward the parking area.